Developing the Medical Clinic at Tan Thach (Ben Tre, Mekong Delta region) is seeing many new initiatives aimed directly at the poor families, being initiated. o Vaccination for children and infants, targeting malarial and common health areas. This is currently being assessed for the danger months. o Part of this program is to identify possible ‘micro business situations’ where poor families can be assisted in developing, with initial grants of materials or tools, small local businesses that can develop to assist them to gain their own income and self esteem over a period of time. Such micro-businesses will be monitored and assistance given as required. In time, their dependence on the health card program will no longer exist. o Eye testing both Clinic and mobile, with free glasses for poor families. 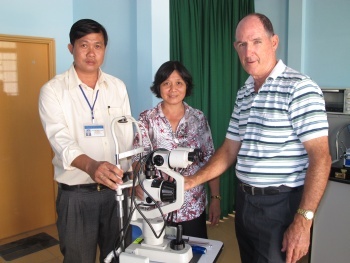 Using both HCMC based optometrists and ophthalmologists, as well as HRA visiting medical personnel, this critical need is now being addressed, thanks to a UPS Foundation grant, that has made funds available for the specialist eye testing equipment. Currently it is estimated as many as 15% of children in the region suffer sight deficiencies, with many of these being major early onset eye diseases that are treatable. HRA’s Scholarship Program for young eye doctors, has seen agreement with HCMC Eye Hospital to release doctors for regular eye clinics at the HRA Medical Clinic in Tan Thach town, Ben Tre province. o Health education for poor families, including nutrition and food guide, garden development and assistance, (eg, as above, micro business with chickens, fish, vitamin rich vegetables etc) and ongoing volunteer input. 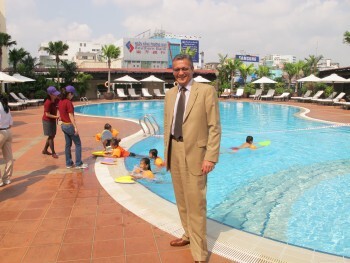 The New World Saigon Hotel, as part of it’s sponsorship agreement with HRA, has invested in the future of many poor children, by working to develop health, nutrition, water safety and other life quality education activities. o Of significance, are the water safety and awareness programs, including learn to swim, CPR and danger recognition and prevention aspects. 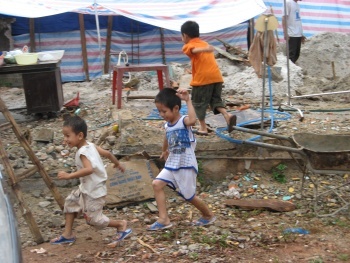 Despite the many waterways in the Mekong Delta, a very high percentage of children have never learnt to swim. Drownings are too common, not only in the wet season. Again, these are preventable. The New World Hotel initiative is a major contribution to safety for many children. o Road safety programs, including awareness issues, helmets, road use and rules, etc. are also due to be initiated later in 2013, and will take place in the provincial areas where the problems exist for so may poor. Despite the governments current crack down on the use of helmets, it is regional in enforcement, and where HCMC may be strict, rural and remote regions are not. Traffic being a problem in all areas, this is therefore a crucial need that must be addressed. Children are generally keen to learn, and accept the change necessary. Again, HRA and the New World will work together, with helmets provided as part of the UPS Foundation grant funding towards these projects. o Dental care and treatment (Central Clinic and water transportation as required) About 40% of children checked have immediate dental needs. This requires both health / dental education, as well as primary treatment. HRA is developing programs in both these areas, in cooperation with local and visiting dentists. Currently, portable dental equipment is a specific need. o Health education & hygiene education, integrated with children’s sponsorship programs, and including women’s and children’s health issues. For many people, survival has taken priority over ‘doing the right thing’. 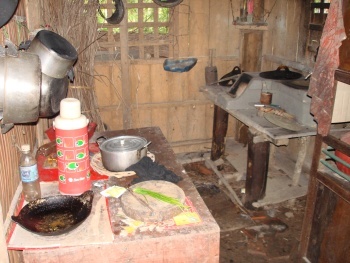 Many know about hygiene, but have no clean water, or facilities. Others lack the knowledge or full understanding of the implications of neglecting basic sanitation and hygiene. o Health education for poor families, including nutrition and food guide, garden development and assistance, (eg, as above, micro business with chickens, fish, vitamin rich vegetables etc) and ongoing volunteer input. o Water safety and awareness programs, including learn to swim, CPR and danger recognition and prevention aspects. Despite the many waterways in the Mekong Delta, a very high percentage of children have never learnt to swim. Drownings are too common, not only in the wet season. Again, these are preventable. o Road safety programs, including awareness issues, helmets, road use and rules, etc. Despite the governments current crack down on the use of helmets, it is regional in enforcement, and where HCMC may be strict, rural and remote regions are not. Traffic being a problem in all areas, this is therefore a crucial need that must be addressed. Children are generally keen to learn, and accept the change necessary. o Dental care and treatment (Central Clinic and water transportation as required) About 40% of children checked have immediate dental needs. This requires both health / dental education, as well as primary treatment. HRA is developing programs in both these areas, in cooperation with local and visiting dentists. o Extension of the Children’s Sponsorship program, bringing awareness of the needs and effectiveness of this program. (Many street kids and poor children still in desperate need of sponsorship for education and life needs.) Refer the “sponsorship page” for specific children currently in desperate need of your support. The online ‘sign up’ is simple and fast! o When the Ambulance Boat is purchased, HRA will initiate regular medical boat patrols to known or recognized families on the waterways, for health checks, or as response to specific needs. The medical ambulance is both a ‘First response Emergency Vessel’, and also a day to day follow up craft, visiting known problem regions or specific situations and families, many living in isolation. The malarial problems especially will be targeted. o HRA has developed a strong regional network with local hospital facilities, and has access to road ambulances to assist in emergency evacuation and first response situations. The local (and HCMC if required) medical facility and transport network is in place already, in preparation for any patient needs. Regular meetings with Provincial Health Directors has ensured both trust and agreement is maintained between HRA personnel and regions. The Clinic has begin to run health education programs. (Poverty often sees soaps, toothpaste and brushes, laundry, bathing fully, etc. as lesser priorities to survival.) With UPS Foundation assistance, many of these programs will also provide essential materials to meet the basic needs. As mentioned above, the medical Ambulance Boat, once operative, can immediately be both on call, as well as be proactive in visiting remote areas. Part of this activity is to form initial agreements (already done verbally with regional officials) for the cooperation of medical personnel, facilities, land and water ambulances. The Clinic has the capacity to be a first stage facility. Water safe and Road wise training is an immediate ‘go’! With so much water, and such horrific road fatality statistics, both these programs are critical. With the provision of the basic materials, (flotation, signage, swimwear / apparel, quality bike helmets, signage for ‘road wise training’, and ‘take home’ literature for ‘whole of family’ awareness, HRA and partner sponsors are making major inroads into the future quality of life for thousands of kids and their families, in Ben Tre Province. The Health Card system being set up currently, will bring direct medical care and pharmaceutical availability as soon as children and families (already identified by HRA in conjunction with town , school and health officials) names and ‘ID’ details are printed in a plastic card. All services to card holders are free. With the implementation of the use of the Medical Ambulance Boat, in conjunction with the Clinic programs, all the above activities can see a huge increase in life quality of the poor families, and a higher incidence of safety, hygiene, health and an improved environment. o To combat “head on” the massive problems of ill health, child disease, poverty, limited schooling and poor life quality in Viet Nam. o To take vital medical equipment, training programs, and volunteer medical personnel to provinces and areas where we are invited, and agree to assist, and to offer scholarships in Australia to select doctors. o To establish and maintain, a strong Children’s Sponsorship program, where 100% of donated sponsorship funds goes to the recipient child. o To see Viet Nam’s people emerge from their current living standards, and by working beside them, assist them in helping themselves to provide facilities, programs and a quality of life that no previous generation has yet enjoyed. o Develop family clinics, education and life training centres in areas where current child sponsorship or aid activities exist, in co-operation with local partners, and develop these Clinic’s as Health Education centres to assist in combating the incidence of diseases among the poor. This especially includes the Medical Clinic in Ben Tre. o Determine needs and activities that are necessary and desired, and help to make them happen, through joint HRA and local interaction, and through the support of sponsors and other grants. As with the above, sustainability is central. o To encourage others to get involved in MAKING IT HAPPEN!